Free Download Fujifilm FinePix JX700 / JX710 PDF User Manual, Instructions, User Guide, Owner's Manual. 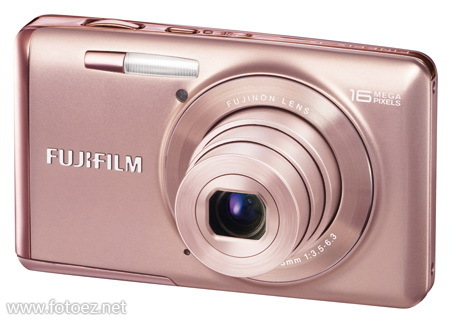 This ease-to-use Fujifilm FinePix JX700 / JX710 offer 5x optical zoom, 16 megapixel resolution, 2.7-inch LCD in a slim and stylish body. The JX700 / JX710 can go everywhere with you, it's the perfect every day camera that the whole family can use. FinePix JX700 / JX710 equipped with a high quality Fujinon 5x zoom lens delivers picture-perfect results across the entire zoom range, from wide-angle compositions to dramatic close-up shots. An impressive 16 megapixels resolution won't miss the finest details of your subject. Images are captured sharp and clear, in vivid colors, even when printed at large sizes. With the Motion Panorama mode, capturing a breath-taking panorama couldn't be easier. simply depress the shutter button, sweep the camera across a scene and the cameras will automatically stitch the images together to create a seamless result. Camera's Digital Image Stabilization automatically detects blurred subjects and instantaneously increases shutter speed to ensure crisp, sharp images. FinePix JX700 / JX710 feature SR Auto mode, which detects the type of scene being photographed and automatically adjusts the camera's settings to suit. Six different scenes can be detected on this mode that includes: Portrait, Backlit Portrait Macro, Landscape and Night. In addition to top-quality still images, the JX700 / JX710 can capture video in 720p HD at 30 fps. And with the in-camera editing functionality offered, users can enjoy trimming, cropping and re-cutting their short movies in-camera without having to upload files to a computer.